1. In 1810, Alexander von Humboldt published "Vues des Cordillères". This work includes pp. 47, 48, 50, 51, 52 of the Dresden in a beautiful, though somewhat not–completely–accurate, color rendition. Ive seen copies of this book on sale for as much as $93,000, and for as little as $25,000, so it is a bit pricey, and quite a collector's item. Neverthless, a color copy of these Dresden Codex pages as shown in Humboldt's volume is archived at: http://web.archive.org/web/20080506143029/http://www.tornadohills.com/strange/maya_codex_large.htm. 2. In 1825 or 1826, an Italian, Agostino Aglio, made a tracing of the Dresden Codex for Lord Kingsborough. It was uncolored, but was used in Lord Kingsborough's "Antiquities of México", published in 9 volumes (the last two posthumously; Kingsborough died of typhus in debtor's prison--the debt was accrued at least partly from these publications). Lord Kingsborough had Aglios rendition of the Dresden prepared in color for Volume III, in 1830 or 1831. Apparently it was colored by hand--for not all of the same-numbered pages from the different copies are identical (Justin Kerr's Photographs of the Kingsborough are available below). J. Eric Thompson leaned heavily on photos of the Förstemann when making his rendition of the Dresden (published in "A Commentary on the Dresden Codex", Philadelphia, 1972). Lips and Deckert also made their rendition from the Förstemann editions (1962, Berlin). Andreas Fuls has made available a CD (for $20 as of April, 2002) of Förstemann's personal copy of the Förstemann, that is now housed in the Ibero-American Institute of Berlin. 4. In 1959, Ian Graham visited Dresden and made slides of the Dresden Codex (personal communication: Oct 17, 1998). From this collection of slides, I have seen only one print: a beautiful partial of Dresden page 49, in a book entitled "Vanished Civilizations of the World" (editor: Edward Bacon, Thames and Hudson, McGraw-Hill, 1963). 5. In 1932, William E. Gates published a facsimile rendition of the Dresden. It is very pleasing to the eye, colorful, and uses his own type-font for all the glyphs. I can't say that it is the most accurate rendition, but it is fun to look at. He said he produced 75 copies (Gates, booklet with "The Dresden Codex", 1932), but I have noticed some unnumbered copies of this edition that may have been put together from extra printed sheets that were picked up by graduate students some time later (personal communication of March or April 1997 with Jeremiah F. Epstein, who was a professor in the Department of Anthropology at the University of Texas, Austin). 6. In 1975, the Akademische Druck- u. Verlagsanstalt, of Graz, Austria, printed a facsimile from color photos of the WWII-damaged original, with commentary by Helmut Deckert and Ferdinand Anders. It is remarkably good, and the worst of the damaged pages have been reproduced again from Förstemann in a separate accompanying booklet. The Graz Dresden, and its Chiapas copy (within the book of Thomas A. Lee, Jr., "Los Códices Mayas", 1985) have been used as important stand-bys by Mayanists since their publications. 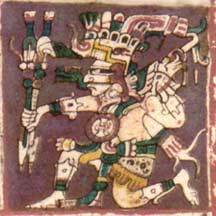 The Graz editions of the Dresden, Madrid and Paris Codices are available online from FAMSI at http://www.famsi.org/research/graz/index.html#Maya. 7. SLUB Dresden (Sächsische Landesbibliothek  Staats  und Universitätsbibliothek Dresden) has uploaded a high-resolution digital version of the WWII-damaged original. This is available from: http://www.slub-dresden.de/sammlungen/digitale-sammlungen/werkansicht/cache.off?tx_dlf[id]=2967. By using the slider given on the page, different resolutions are obtainable, and can be saved. A PDF file of good resolution can also be downloaded from the site. Because the Dresden had fallen apart in previous years, later Europeans assigned to it page numbers that, upon further study of the codex, have been thought to be incorrect. The page numbers were kept pretty much the same however, with the understanding that the order of the pages within the codex was probably 1-24, 46-74, and 25-45. NOTE: We've found that it's faster and easier to view these documents if you download the individual files to your computer and open them locally. To download and save, right click on the file, choose "save as" from the menu, pick a location ( for example "My Documents" ) and click "Save". The complete Förstemann version of the Dresden Codex in PDF format (95.7 MB). The complete Kingsborough version of the Dresden Codex in PDF format. (48.2 MB).